Searching for a fine quality area rug? You can save a lot of time, trouble, and money by using your smartphone to call Brandon (215-794-2300) instead of using it to try and find the rug of your dreams online via internet rug sellers. 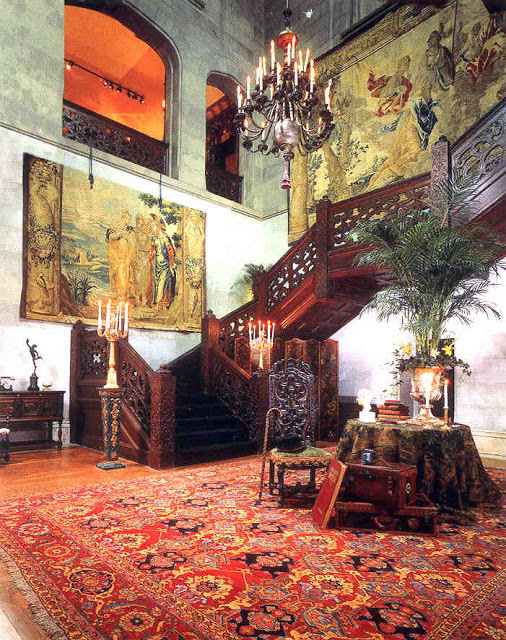 Real, handmade oriental rugs are a superb acquisition for the home. 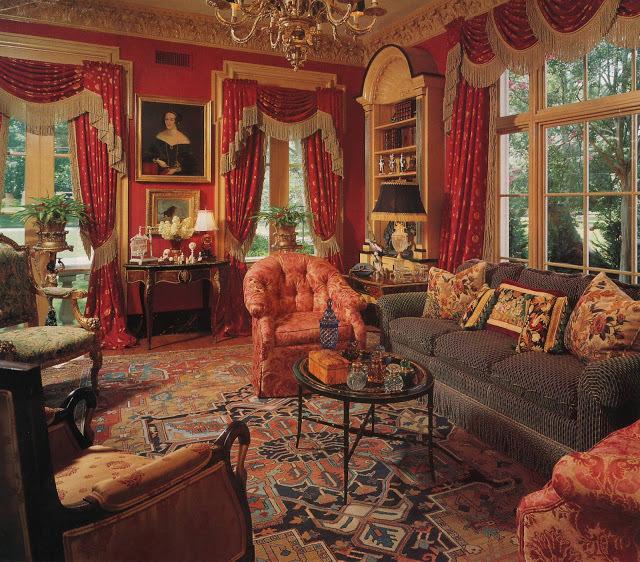 Like other estate treasures, they offer a lifetime of pride and pleasure from ownership and use. Brandon Oriental Rugs believes that the experience of acquiring a fine rug should be a pleasure as well. With over twenty-five years at our one and only store location, our good reputation was established and is sustained by providing the best quality, best service, and best price (based on quality); with customer satisfaction our paramount concern. Brandon's complimentary services include free delivery, in-home trials (of multiple rug choices), and design consultations (with you or your interior designer) to establish the best colors, styles, and qualities for you and your unique decorating needs. 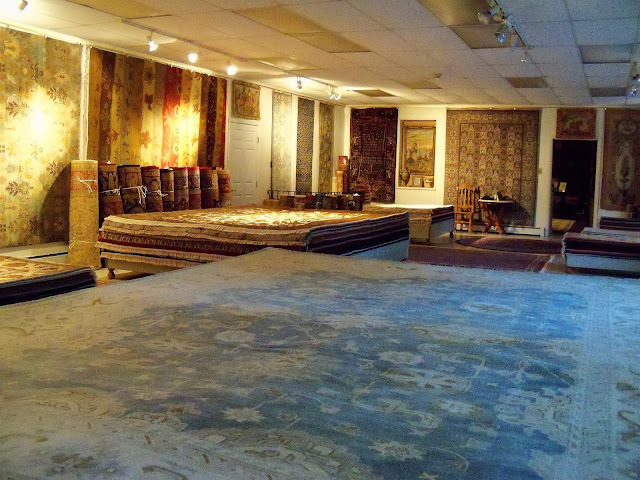 There really is a better way to shop for and acquire oriental rugs. 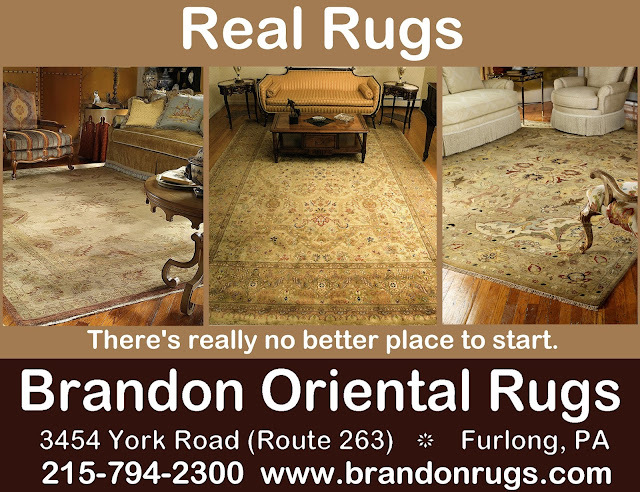 Visit Brandon Oriental Rugs anytime and see what a REAL rug sale is all about. Save based on quality anytime. No reason to wait for a SALE to feel confident about getting the best possible value. No reason to hurry. No reason to wait. No hype. No Pressure. Just REAL. If you are going to do area rugs in your home, do it right. If you don't want to throw money away on short term fixes, take time to get the facts about what matters. Actually go shop in person to find out about what is available. Consider all that matters to you. Look at colors, designs and textures. Feel the weight and thickness and softness of each rug. Think about the significance of what you are hearing about the benefits of each feature. Matters of enduring consequence (like what you choose to put on your floors) need not be decided in a rush. In fact, the only rush you should feel any need to respond to is the one you'll experience when you find the perfect rug for your needs and taste. 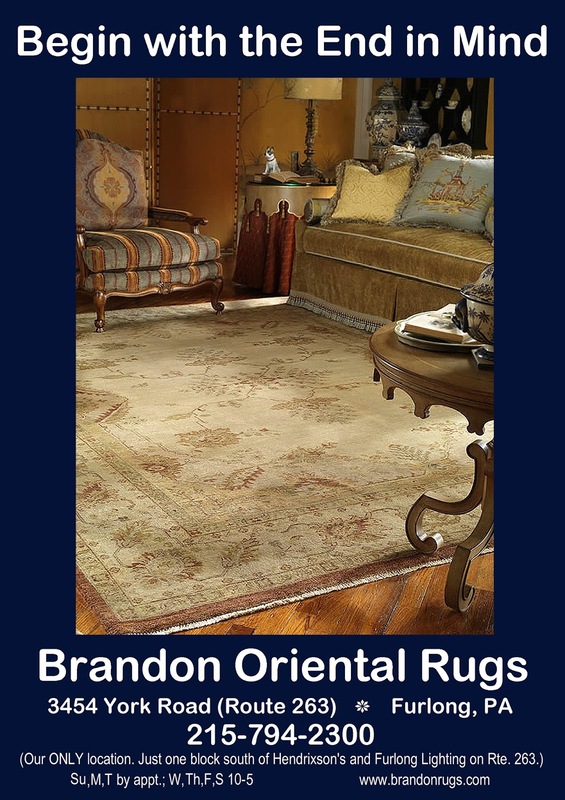 For over a quarter century, Brandon Oriental Rugs has proudly provided a NO PRESSURE, service oriented shopping experience to help our customers acquire the fine quality rugs they want. Keep in mind that if you are not looking in the right place, you might never find what you truly want. 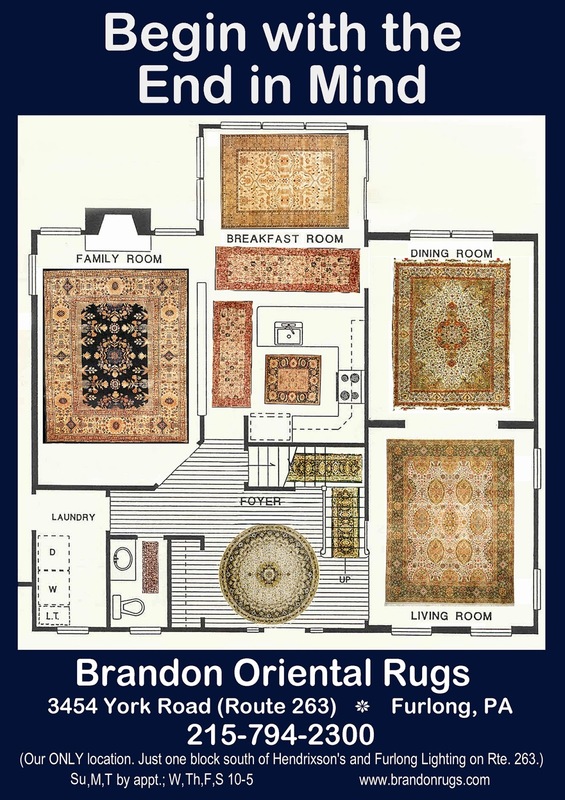 Brandon Oriental Rugs offers many complimentary services to help you explore all of the possibilities and benefits provided by fine quality rugs. Rug-Search(tm) - to find solutions from the universe of what is available; not just what happens to be in store today. Professional Design Consultations to clarify needs and desires (at our store or in your home; with you and/or your interior designer.) Whether you are are starting with a rug or using it to finish an otherwise complete room, we can help you save a lot of time, effort, and confusion. In-home trial of multiple rugs allowing you to try before you buy, and to experiment with different concepts at one time so you can easily establish what is best. Quality pricing that permits meaningful comparison shopping and "no pressure" decisions. All that we offer is available to all within a wide radius of our store, conveniently located in the center of beautiful Bucks County, Pennsylvania. There's a First Step to Every Process (Including Decorating Your Home). Begin With the End In Mind. Empty rooms are full of possibilities. Creativity motivates us to fill the void. At least in places where company will be invited to join us, that which is bare asks for cover. Just as we know to adorn ourselves, our tastes and appreciation of style naturally guide our choices for the furnishing of the spaces we inhabit. Collective cultural wisdom likewise sets sensible guidelines for decisions: "Costly thy habit as thy purse can buy, but not expressed in fancy; rich not gaudy..."
With self-definition a comfortable habit, setting goals for expansive self-expression needed to decorate a home is easy. Collective wisdom helps us embark: "Begin with the end in mind." The blueprints for our vision, whether formally drawn or held intuitively within, guide our steps. We know to build from the ground up. We know that an anchor prevents drifting. We know that a common precursor permits harmonization in subsequent specialization. With that knowledge, selection of an oriental rug to put flesh on the bare bones of an empty room is an acknowledged stroke of genius. There is REALLY no better place to start.